The quintet performs in the biggest festivals and the biggest concert rooms in Europe. Due to a directory specifically designed for it , the ensemble has developed a style and a unique sound, which allow them to make the link between tradition and innovation, between pure chamber music and “l’illusion symphonique”. The great violinist Jozsef Lendvay will be the special guest of the program. « The saxophone, thanks to the reunion of these five exceptional musicians, earns a new voice full of attention to detail as well as a sounding aesthetic enhanced with an infinite variety of colours”. 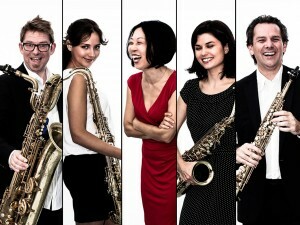 Founded by Daniel Gautier, currently the first Professor occupying a chair of classical saxophone in Germany, the Quintette is made up of Magdalena Lapaj (Prize winner of the “Concours International de musique contemporaine in Karlsruhe), Asya Fateyeva (Prize winner of the “Concours international Adolphe Sax” in Dinant), Sebastian Pottmeier (Prize winner of contemporary music from the “Concours international Riviera del Conero), and the pianist Jang Eun Bae, who studied at the Mozarteum in Salzburg. Set up in Cologne, the Quintette performs for the most important festivals and in the most prestigious concert halls in Europe. From the Gasteig in Münich, the Gewandhaus in Leipzig, the Festival in Lucerne, the Ludwigburger Schlossfestspiel , to the Tallin Philharmony and the Glazounov’s Hall in St Petersbourg’s conservatory, the Alliage’s effect arouses the enthusiasm both from the public and the critic. Many tours in Asia and North America complete the career of the ensemble. Thanks to his own repertory, the ensemble has developed a unique style and sound, which allows them to forge links between tradition and innovation, between pure chamber music and “symphonic illusion”. This repertory, based on the great works of classic literature, allows each member to enhance his own qualities while contributing to the whole sensitivity of the Quintette. On top of many programs recorded for the radio and television (Arte, ZDF…), the numerous recordings of the ensemble testify to the artistic originality of the group. They received twice “Le Grand Prix du Disque Echo Klassik”, for the CD “Una voce poco fa” and its Opera fantasia, and for “dancing Paris”. Recorded with the Hungarian violinist Jozseph Lendvay, this recent CD makes us share the delirious atmosphere in the French capital at the time of the “Boeuf sur le toit”. “A la recherche du rêve perdu”, “Masquerade”, and “Voyage russe” complete the discography of the ensemble, who only records for the label “Sony Classical”. In autumn 2015 a new album will be released, with the collaboration of the clarinettist Sabine Meyer.